The song features the melody of the University of Wisconsin's fight song, "On, Wisconsin! ", although it is a tribute to Hawthorne High School, which the Wilson brothers attended. Hawthorne High School's fight song uses the same melody as "On Wisconsin". The Beach Boys recorded two studio versions of this song. The original recording, which appeared on the album, was made on September 2, 1963, and was in a higher key and at a slower tempo than the second version which was released as a single. The second version features The Honeys chanting various "cheerleader yells" before each chorus. The concept for the single version, recorded later that week, was born in the same studio session that Brian and Mike created the original idea for "Fun, Fun, Fun", backstage in Farmington, Utah. The single version was backed with "In My Room", a collaboration between Brian and Gary Usher, released as Capitol 5069. 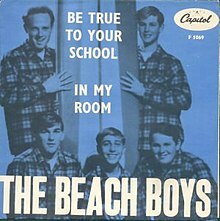 "Be True to Your School" charted at number 6 on the Billboard charts, and number 4 in the Music Reporter trade paper top 100 and in the United Press International top 20 survey of jukebox play across the United States. It rated number 3 in New Zealand's Lever Hit Parade, number 6 in Sweden, and number 10 in Sydney, Australia as cited by a contemporary issue of Billboard. Rising to popularity when the Beach Boys were still thought of as a Southern California phenomenon, it did best in Los Angeles: three weeks at #1 (KFWB). The Knights covered the song in 1964 on their album Hot Rod High. Jan & Dean included the song on their 1985 album Silver Summer. The song is featured in an episode of Gilmore Girls, where the town troubadour (portrayed by Grant-Lee Phillips) is playing it during a pep rally. The song's title is parodied by heavy metal band Twisted Sister in their song "Be Crool To Your Scuel". Mike Love performed the song on a telethon on the Full House episode "Our Very First Telethon". The song is featured in the 1980s American TV series Riptide. The song is also the title of the episode (Season 2 Episode 7). The song was part of an oldies melody in the 2005 Tokyo Disneyland parade/show "Disney's Rock Around The Mouse". The song is featured in the ending credits of the HBO series Vice Principals Season 1 Episode 1. ^ Jenny Price. "Fight on for Her Fame", On Wisconsin Magazine, Winter 2009. ^ Stebbins, Jon; David Marks (2007). The Lost Beach Boy. London: Virgin Books. p. 104. ISBN 978-1-85227-391-0. "All Dressed Up for School"
This page was last edited on 21 March 2019, at 18:22 (UTC).